George is blinded by his own megalomania and in relentless pursuit for historic recognition at any cost, but he has a sneaking suspicion that Elizabeth and Ross might have the last laugh after all. Luckily for Elizabeth, there is no way to determine paternity of Valentine (Raphael J. Bishop) and it torments George to no end. He believes his life would be complete and perfect when he is knighted. Not so fast. Elizabeth cooks up a scheme to put an end to George’s mistrust of her devotion, but it backfires on her. Be careful what you wish for, George. Dr. Dwight Enys (Luke Norris), the only sensitive soul of this series, has his shares of heartbreaks and losses. Caroline (Gabriella Wilde) hesitantly ventures into parenthood, but it doesn’t end well. Too proud to admit her ‘failure,’ Caroline makes a bolt for London. When an entitled and privileged socialite marries a poor doctor with a heart of gold, there’s no doubt who wears the pants. Can this fragile relationship survive the tragedy? We shall see. It’s fascinating to observe and analyze the three passive aggressive marriages in the 18th century England. Naturally, those in superior positions (Ross, George, and Caroline) impact their spouses’ self-esteem and the subordinate partners (Demelza, Elizabeth, and Dwight) develop a progressive feeling of isolation and being left emotionally depleted. No wonder the passive partners resort to every trick in the book. Playing coy and then crying foul gets old quickly, Demelza. You’ve done that one too many times; it’s not cute any more. “You never solve problems in a relationship by turning away from your partner,” says Dr. Phil. I realize that his advise might be a foreign concept to unequal partnerships in the 18th century, but you act like Ross’ equal partner yet resort to your usual tricks as you see fit. That doesn’t sit well with me. You can’t have your cake and eat it too. 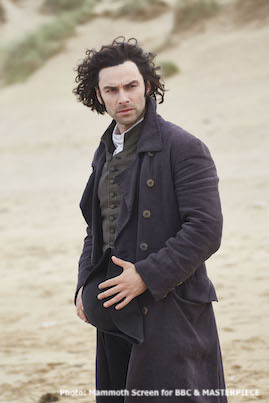 Poldark returns Sunday, September 30, 2018 for the fourth season on PBS’ MASTERPIECE.